I’ve got some really good news for Amazon DynamoDB users! 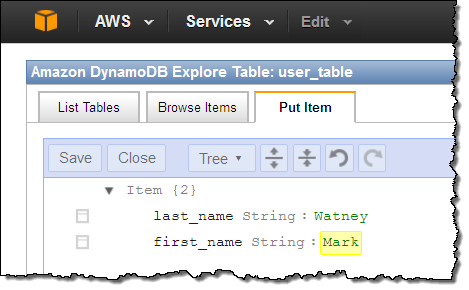 First, the DynamoDB Streams feature is now available and you can start using it today. 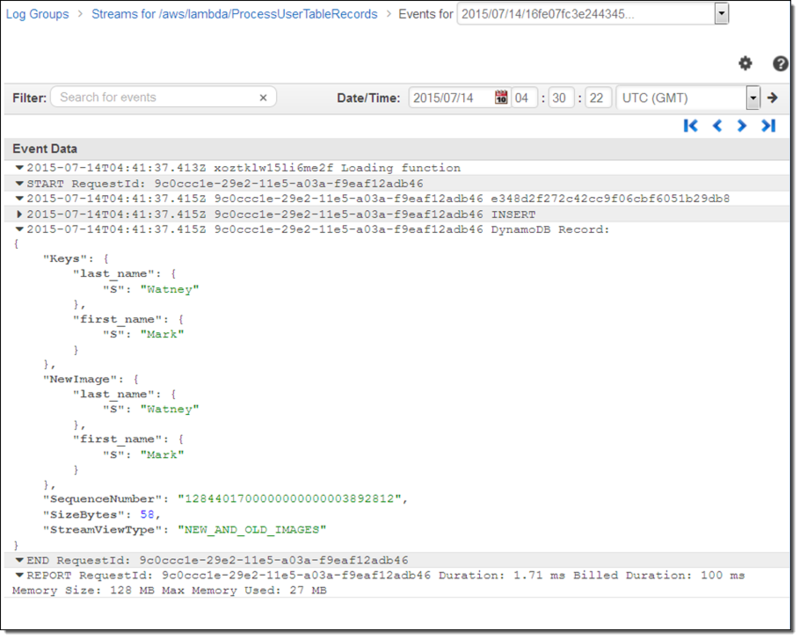 As you will see from this blog post, it is now very easy to use AWS Lambda to process the change records from a stream. Second, we are making it really easy for you to replicate content from one DynamoDB table to another, either across regions or within a region. 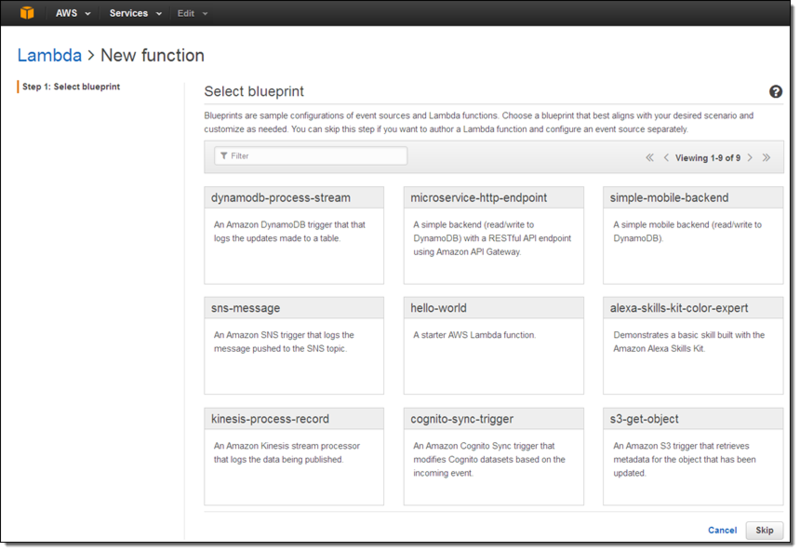 We launched a sneak preview of DynamoDB Streams last fall, just a couple of days before AWS re:Invent. As I wrote at the time, we built this feature because many AWS customers expressed a desire to be able to track the changes made to their DynamoDB tables. DynamoDB Streams are now ready for production use. Once you enable it for a table, all changes (puts, updates, and deletes) are tracked on a rolling 24-hour basis and made available in near real-time as a stream record. Multiple stream records are grouped in to shards and returned as a unit for faster and more efficient processing. The relative ordering of a sequence of changes made to a single primary key will be preserved within a shard. Further, a given key will be present in at most one of a set of sibling shards that are active at a given point in time. As a result, your code can simply process the stream records within a shard in order to accurately track changes to an item. Your code can retrieve the shards, iterate through the records, and process them in any desired way. The records can be retrieved at approximately twice the rate of the table’s provisioned write capacity. You can enable streams for a table at creation time by supplying a stream specification parameter when you call CreateTable. You can also enable streams for an existing table by supplying a similar specification to UpdateTable. In either case, the specification must include a flag (enable or disable streams), and a view type (store and return item keys only, new image only, old image only, or both new and old images). Read the new DynamoDB Streams Developer Guide to learn more about this new feature. You can create DynamoDB Streams on your DynamoDB tables at no charge. You pay only for reading data from your Streams. Reads are measured as read request units; each call to GetRecords is billed as a single request unit and can return up to 1 MB of data. See the DynamoDB Pricing page for more info. AWS Lambda makes it easy for you to write, host, and run code (currently Node.js and Java) in the cloud without having to worry about fault tolerance or scaling, all on a very economical basis (you pay only for the compute time used to run your code, in 100 millisecond increments). 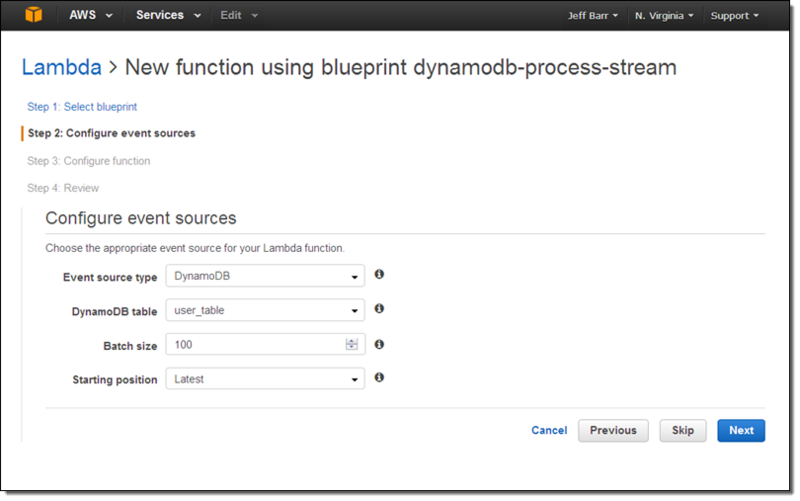 As the centerpiece of today’s launch of DynamoDB Streams in production status, we are also making it easy for you to use Lambda to process stream records without writing a lot of code or worrying about scalability as your tables grow larger and busier. You can think of the combination of Streams and Lambda as a clean and lightweight way to implement database triggers, NoSQL style! Historically, relational database triggers were implemented within the database engine itself. As such, the repertoire of possible responses to an operation is limited to the operations defined by the engine. Using Lambda to implement the actions associated with the triggers (inserting, deleting, and changing table items) is far more powerful and significantly more expressive. You can write simple code to analyze changes (by comparing the new and the old item images), initiate updates to other forms of data, enforce business rules, or activate synchronous or asynchronous business logic. You can allow Lambda to manage the hosting and the scaling so that you can focus on the unique and valuable parts of your application. If I was building a real application, I could start with the code provided by the blueprint and add more functionality from there. AWS customer Mapbox is already making use of DynamoDB Streams and Lambda, take a look at their new blog post, Scaling the Mapbox Infrastructure with DynamoDB Streams. 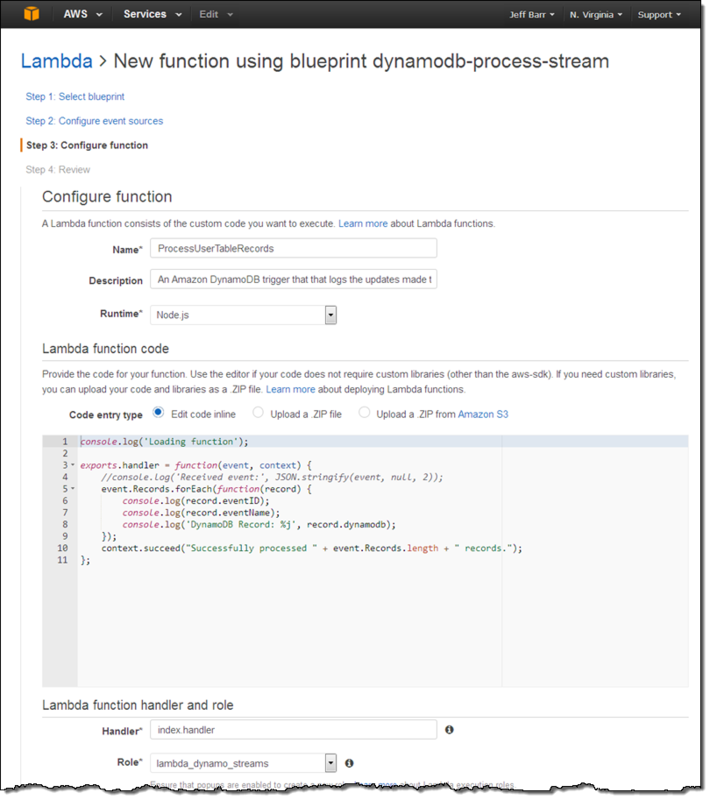 To learn more about how to use DynamoDB and Lambda together, read the documentation on Using DynamoDB Streams and AWS Lambda. There is no charge for DynamoDB Triggers; you pay the usual rates for the execution of your Lambda functions (see the Lambda Pricing page for more information). I believe that this new feature will allow you to make your applications simpler, more powerful, and more responsive. Let me know what you build! As an example of what can be done with the new DynamoDB Streams feature, we are also releasing a new cross-region replication app for DynamoDB. This application makes use of the DynamoDB Cross Region Replication library that we published last year (you can also use this library as part of your own applications, of course). 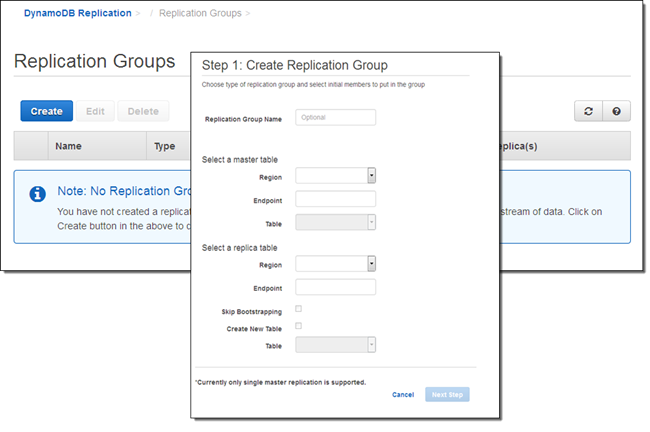 You can use replication to duplicate your DynamoDB data across regions for several different reasons including disaster recovery and low-latency access from multiple locations. As you’ll see, the app makes it easy for you to set up and maintain replicas. This app runs on AWS Elastic Beanstalk and makes use of the Amazon EC2 Container Service, all launched via a AWS CloudFormation template. This feature is available to you at no charge. You will be charged for the resources (provisioned throughput and storage for the replica tables, data transfer between regions, reading data from the Streams, the EC2 instances, and the SQS queue that is used to control the application). See the DynamoDB Pricing page for more information. Read about Cross Region Replication to learn how to set everything up! Amazon Echo is a new type of device designed around your voice. Echo connects to Alexa, a cloud-based voice service powered (of course) by AWS. You can ask Alexa to provide information, answer questions, play music, read the news, and get results or answers instantly. When you are in the same room as an Amazon Echo, you simply say the wake word (either “Alexa” or “Amazon”) and then make your request. 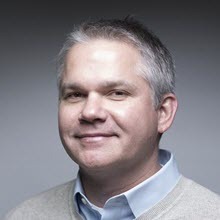 For example, you might say “Alexa, when do the Seattle Mariners play next?” or “Alexa, will it ever rain in Seattle?” Behind the scenes, code running in the cloud hears, understands, and processes your spoken requests. Today we are giving you the ability to create new voice-driven capabilities (also known as skills) for Alexa using the new Alexa Skills Kit (ASK). You can connect existing services to Alexa in minutes with just a few lines of code. You can also build entirely new voice-powered experiences in a matter of hours, even if you know nothing about speech recognition or natural language processing. We will also be opening up the underlying Alexa Voice Service (AVS) to developers in preview form. Hardware manufacturers and other participants in the new and exciting Internet of Things (IoT) world can sign up today for notification when the preview is available. Any device that has a speaker, a microphone, and an Internet connection can integrate Alexa with a few lines of code. In order to help to inspire creativity and to fuel innovation in and around voice technology, we are also announcing the Alexa Fund. The Alexa Fund will provide up to $100 million in investments to support developers, manufacturers, and start-ups of all sizes who are creating new designed around the human voice to improve customers’ lives. You can build new skills for Alexa using AWS Lambda. You simply write the code using Node.js and upload it to Lambda through the AWS Management Console, where it becomes known as a Lambda function. After you upload and test your function using the sample events built in to the Console, you can sign in to the Alexa Developer Portal, register your code in the portal (by creating an Alexa App), and then use the ARN (Amazon Resource Name) of the function to connect it to the App. After you complete your testing, you can publish your App in order to make it available to Echo owners. Lambda will take care of hosting and running your code in a scalable, fault-tolerant environment. In many cases, the function that supports an Alexa skill will remain comfortably within the Lambda Free Tier. Read Developing Your Alexa Skill as a Lambda Function to get started. You can also build your app as a web service and take on more of the hosting duties yourself using Amazon Elastic Compute Cloud (EC2), AWS Elastic Beanstalk, or an on-premises server fleet. If you choose any of these options, the service must be Internet-accessible and it must adhere to the Alexa app interface specification. It must support HTTPS over SSL/TLS on port 443 and it must provide a certificate that matches the domain name of the service endpoint. Your code is responsible for verifying that the request actually came from Alexa and for checking the time-based message signature. To learn more about this option, read Developing Your Alexa App as a Web Service. Many AWS customers are using AWS Lambda to build clean, straightforward applications that handle image and document uploads, process log files from AWS CloudTrail, handle data streamed from Amazon Kinesis, and so forth. With the recently launched synchronous invocation capability, Lambda is fast becoming a favorite choice for building mobile, web and IoT backends. Today we are making Lambda even more useful by giving you the ability to write your Lambda functions in Java. We have had many requests for this and the team is thrilled to be able to respond. This is the first in a series of additional language options that we plan to make available to Lambda developers. Your code can make use of Java 8 features (read What’s New in JDK 8) to learn more) along with any desired Java libraries. 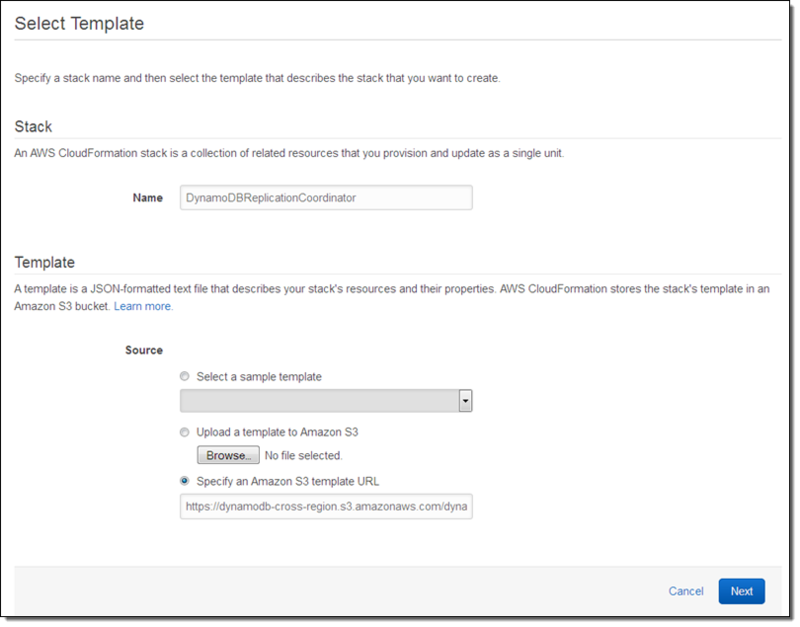 You can also use the AWS SDK for Java to make calls to the AWS APIs. We provide you with two libraries specific to Lambda: aws-lambda-java-core with interfaces for Lambda function handlers and the context object, and aws-lambda-java-events containing type definitions for AWS event sources (Amazon Simple Storage Service (S3), Amazon Simple Notification Service (SNS), Amazon DynamoDB, Amazon Kinesis, and Amazon Cognito). You may also want to spend some time learning more about the Lambda programming model for Java. The class in which your Lambda function is defined should include a public zero-argument constructor, or define the handler method as static. Alternatively, you can implement one of the handler interfaces (RequestHandler::handleRequest or RequestStreamHandler::handleRequest) available within the Lambda core Java library. You can continue to use your existing development tools. In order to prepare your compiled code for use with Lambda, you must create a ZIP or JAR file that contains your compiled code (CLASS files) and any desired JAR files (Note that deployment packages uploaded to Lambda are limited to 50 MB). Your handler functions should be stored in the usual Java directory structure (e.g. com/mypackage/MyHandler.class); the JAR files must be directly inside of a lib subdirectory. In order to make this process easy, we have published build approaches using popular Java deployment tools such as Maven and Gradle. Specify a runtime of “java8” when you upload your ZIP file. If you implemented one of the handler interfaces, provide the class name. Otherwise, provide the fully qualified method reference (e.g. com.mypackage.LambdaHandler::functionHandler). You can start writing your Lambda functions in Java today! To learn more, read about Authoring Lambda Functions in Java in the Lambda documentation. We received a lot of great feedback during the preview period. We have used your feedback to update and prioritize our development roadmap and I would like to share the results with you in this blog post. It was great to hear that you (and many other developers) plan to use Lambda to host mobile, website, and device backends. We have added several features to Lambda in order to provide you with even more power and flexibility for this important set of use cases. I’ll get to that part in a minute. First and foremost, Lambda is now ready for production workloads. You can now run up to 100 concurrent requests per account (up from 50 during the preview). If your application is taking off like a rocket and you need to be able to run more requests concurrently, get in touch and we’ll do our best to help out in an expeditious fashion. Lambda will start to execute your code within milliseconds, provided that the function exists, that it has the proper permissions, and that you are within your account-level limit for concurrent requests. Taken together, these two factors give Lambda the scale and the responsiveness necessary to host high-volume production applications. Lambda’s fine-grained pricing means that your applications, even at scale, will be cost-effective to run. Synchronous Invoke -Your application can now invoke a Lambda function synchronously and receive a response as soon as it finishes executing. The arguments and the response can be expressed in JSON notation. You can try out the new invocation model using this simple walk through: Handling Events from User Applications. New Triggers – You can now invoke Lambda functions using Amazon Simple Notification Service (SNS) notifications as triggers. 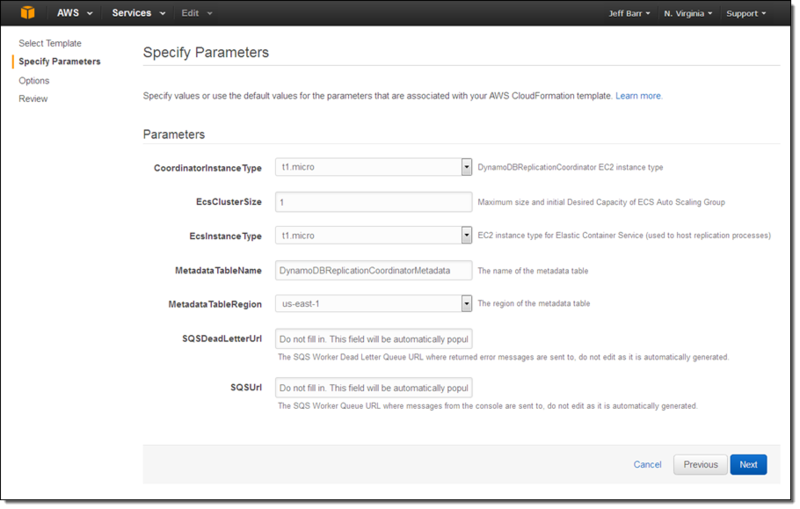 You can also invoke them in response to a request made via the AWS Mobile SDK (Android and iOS). To learn more about invoking Lambda functions using Amazon SNS, visit the Amazon SNS Developers Guide. Simplified Access Model – You can now use a single IAM role (instead of the pair that were previously required) to grant execution permission to your Lambda functions. The console includes one-click role creation and will also help you to bring your existing execution roles into conformance with the new, simpler model. Read Introduction to Permissions Model to learn more. Cross-Account Access to Resources – Lambda has also added support for resource based policies and cross account access, allowing to now grant permissions to invoke Lambda functions from another AWS account. 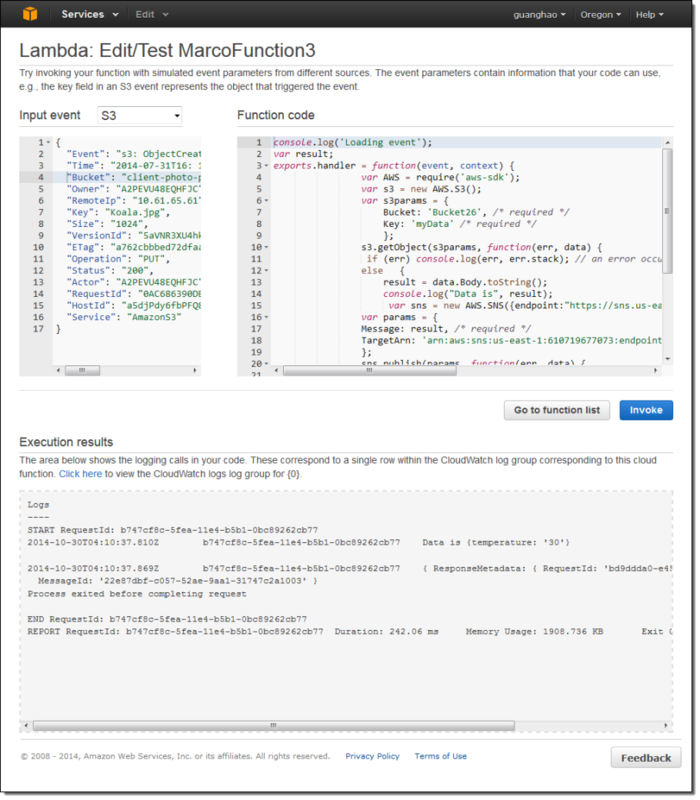 Enhanced Console – You can now use the AWS Management Console to add, edit, and remove Amazon Kinesis streams as event sources. You can also now view all event sources for a Lambda function in one place, making it much easier to see what’s triggering your function. Take the new console for a spin for Kinesis and read Getting Started with Kinesis Events to learn more. 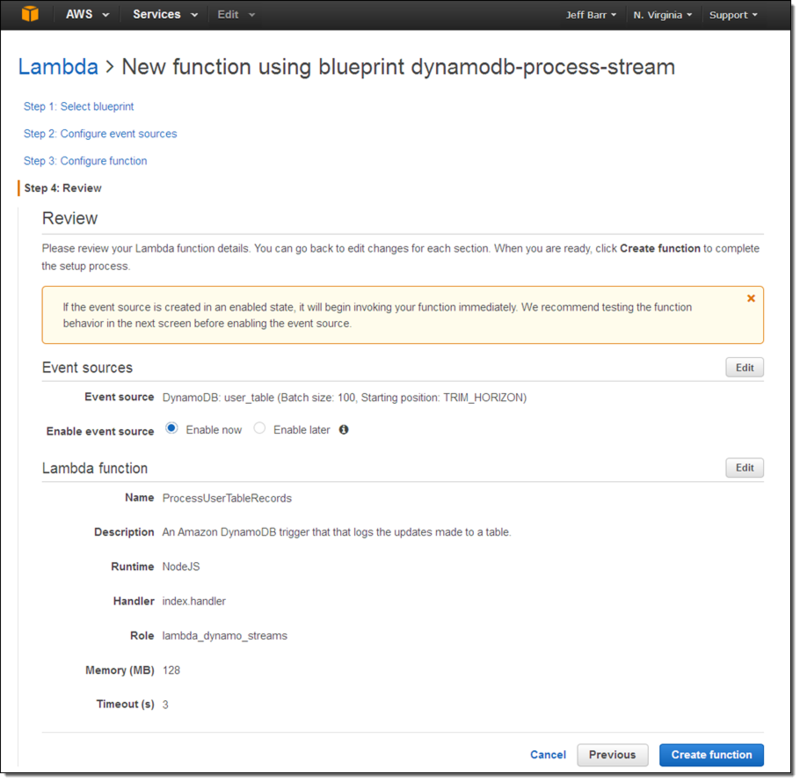 Multiple Functions – You can now attach more than one Lambda function to a single Kinesis or DynamoDB stream. If you plan to do this with a Kinesis stream, we recommend that you have sufficient shards to handle the expected number of concurrent requests. Enhanced Metrics & API – We added metrics for throttling, improved the event source management APIs, and streamlined Lambda’s programming model. 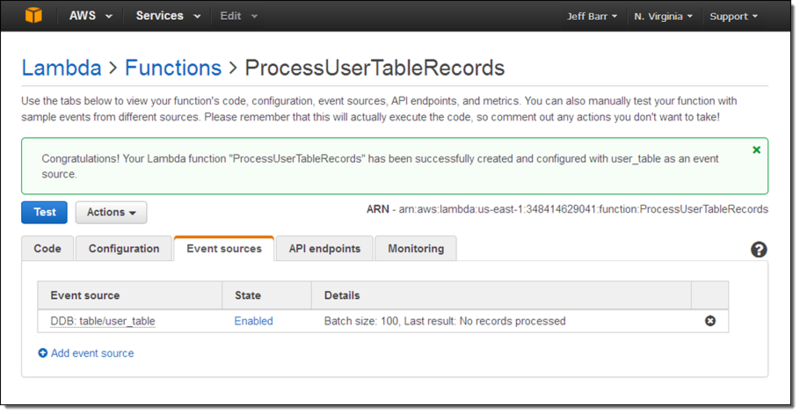 Cognito Events – You can now invoke a Lambda function as part of the synchronization process for a Cognito Dataset. Read about Cognito Events to learn more. Mobile applications often attract a large user base very quickly. Whether you are just prototyping a mobile app or already have a large user base, you can count on Lambda to instantly add a backend that can scale automatically. As I mentioned earlier, developers are already using Lambda as an integral part of sophisticated mobile apps. They are able to create scalable server-side components (the mobile backend) without having to think about compute, storage, load balancing, and the like. However, the asynchronous processing model means they cannot use it in latency sensitive tasks, such as responding to in-app activity. The new Synchronous Invoke feature that I described above is a great fit for this use case. Lambda functions that have been invoked in synchronous fashion via the Mobile SDK receive detailed context information as part of the request. 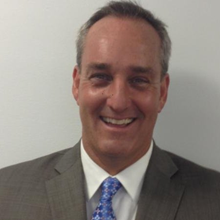 They have access to application data (name, build, version, and package), device data (manufacturer, model, platform), and user data (the client id). Because function are invoked within milliseconds, the mobile backend can respond to requests with great rapidity. You can improve your overall app experience without having to worry about hosting or scaling backend code. The AWS Mobile SDKs for Android and iOS now include support for the new Synchronous Invoke feature. You can also use the AWS Mobile SDK as an event source in order to run your Lambda code in response to events that occur on the mobile device. Amazon Cognito is a service that makes it easy to save user data, such as app preferences or game state, in the AWS Cloud without writing any backend code or managing any infrastructure. You can now trigger execution of your Lambda functions when Cognito syncs a Dataset. Your Lambda function can participate in the sync operation by validating, filtering, or modifying the incoming data. That roadmap I mentioned above? We are just getting started and we have all sorts of cool stuff in the works. 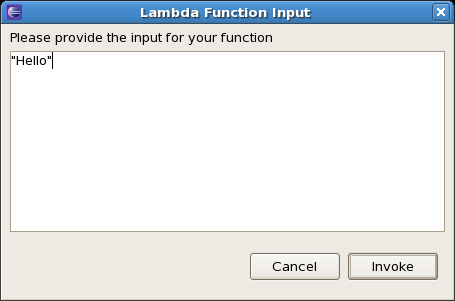 For example, you will soon be able to write your Lambda functions in Java! You will also be able to use Lambda functions to intercept and process merge and conflict resolution events on your Cognito Datasets. We also have great partners starting to participate in the Lambda ecosystem! 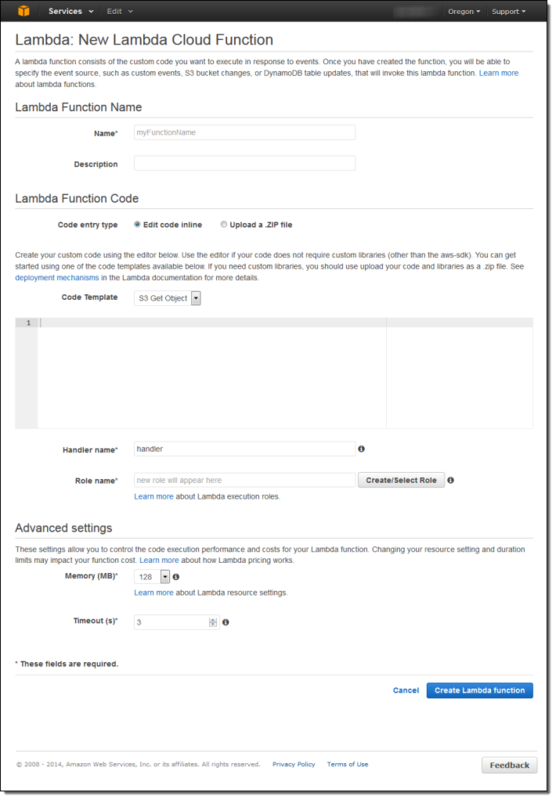 For example, Codeship announced AWS Lambda support for deploying Lambda functions, which makes it easy to make updates to Lambda functions without having to do manual updates or build your own deployment system. 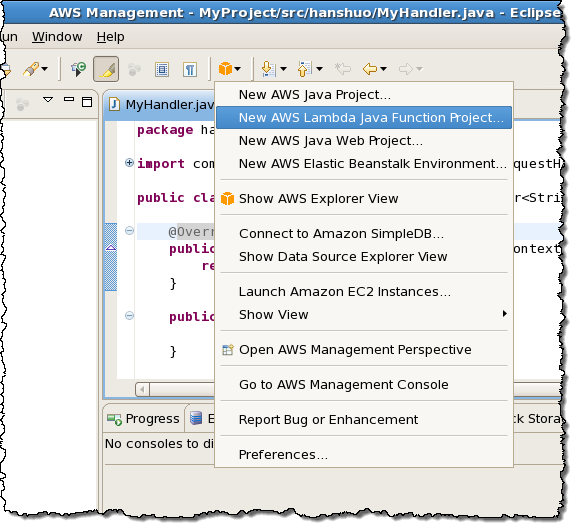 Read Getting Started with AWS Lambda to learn how to create your first function. Check out the What’s New Page to learn more about the features that I described above. Take Lambda for a spin and let me know what you come up with! Lambda is available today in preview form in the US East (Northern Virginia), US West (Oregon), and EU (Ireland) Regions. If you would like to get started, register now.